The click of cameras, and the splash of waves, sound through the air as the current Learning Vacation gets under way. Belugas in the Bay: Through the Camera Lens is a five-night-long whale adventure, combining photography and marine biology as means to observe these toothed, but hardly ferocious, animals. But observing the whales and finding the right photo opportunity are two distinct challenges, requiring both attention and skill. Beluga whales (Delphinapterus leucas) are distinctive creatures: their ability to turn their heads from side to side is unusual in a whale, whose cervical vertebrae are usually fixed, and they can swim backwards, another rare trait. They are naturally playful, curious, and agile, not to mention talkative. Despite having no vocal cords, they can produce sound through their blowholes as well as through their mouths, using the fat deposits in their heads to direct it. Their nickname, ‘canaries of the sea,’ attests to their range of sound – the squeaks, chirps, and clicks by which they interact. On our estuary tour aboard zodiac boats the captain deployed hydrophones to broadcast the underwater soundtrack. The next water-based excursion the belugas’ characteristic noises were not noted as we kayaked around the Churchill River in search of them, but they did surface several times, playing with the rudders of the boats and blowing bubbles under the water. The migration path of the western Hudson Bay beluga population takes the whales northward in the winter, to feed on Arctic and polar cod in Hudson Strait. Kristin Westdal, marine biologist and Learning Vacation instructor, has been working with this group of whales for several years, tracking individual animals to learn of their migration patterns. Just as illustrative are the accounts of elders in northern communities, who provide a link to previous generations through stories passed down from their parents. The presence of the predatory orcas, in the high arctic regions, goes back several generations, as evidenced in oral tradition and art. In the Hudson Bay region, however, these whales are a much newer phenomenon. 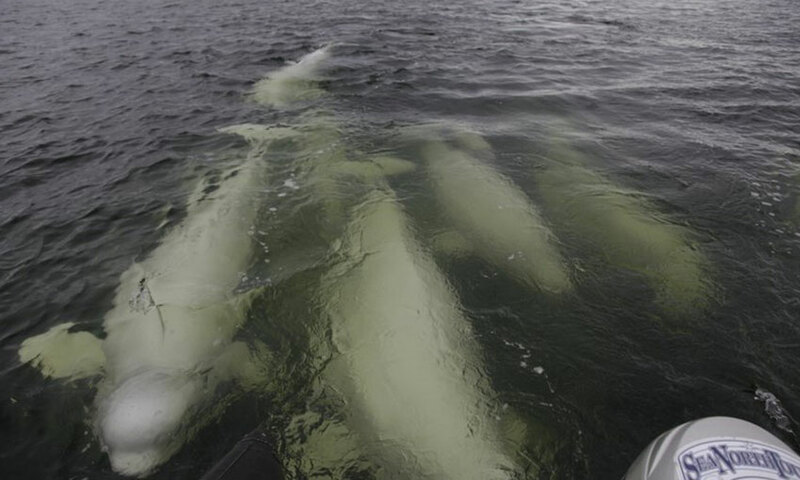 With less sea ice to block their passage, and a tempting concentration of belugas to hunt, they have been seen far more frequently of late, and the stories about them are fewer and more recent. Belugas themselves have been hunted by Inuit communities for centuries, pursued among other things for their maktaaq – the blubber that makes up 40% of their bodies, and is often described asmamaqtuq, meaning ‘delicious.’ The whales’ preference for ice means that, like their close relative the narwhal, they are present in the Arctic throughout the year. Still, with their resemblance to the ice and the brief time they spend at the surface, they would make a difficult quarry. It certainly holds true when seeking them with a camera. Chris Paetkau, founder and CEO of Build Films as well as Learning Vacation instructor, encourages the group to rise to the challenge. Every evening, Kristin’s talk on the science of belugas is followed by Chris’s talk on photography, specifically of wildlife and whales. Seeing Chris’s spectacular underwater shots can seem daunting, but his instructions are clear: watch for your moment, and get up close. No matter what kind of camera you have from cell phone to professional, it’s possible to compose a good shot. Technique matters just as much as opportunity. Over the course of their stay, guests will hone the art of finding their moment. Every day brings new adventures, and with them, new points of curiosity. In photography and science alike, the power of observation counts for much, and there’s no better way to learn that than going out among the whales. Karin Murray-Bergquist is a writer, a sailor, and a Masters of Arts in Viking and Medieval Norse Studies. She is spending the summer in Churchill after studying at the University of Iceland. The Churchill Northern Studies Centre has just opened registration for next year’s Learning Vacation- Belugas in the Bay: Through the Camera Lens. The program will run from June 22 – 27, 2018. We also have another Beluga program running from July Visit our website www.churchillscience.ca/events to enroll or email for further details: [email protected] -20% of the program tuition is all that’s required to ensure your reservation for an incredible experience!